What is the Gift Voucher email? This email is sent to the Gift Voucher recipient at the selected date and time. 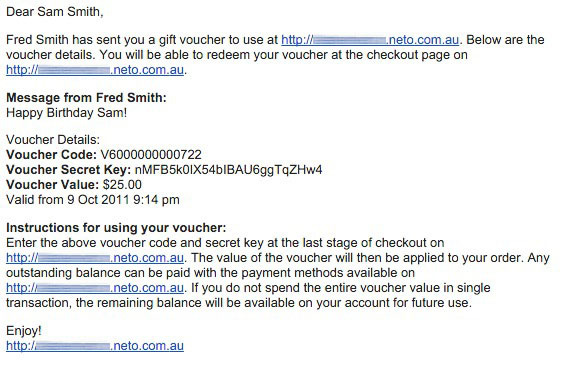 The email contains the voucher number and secret code the recipient will need to redeem their voucher in the checkout. When does the Gift Voucher email send? When the customer adds a Gift Voucher to an order, they are asked to enter the details of the recipient and when the voucher is emailed. The process that sends the voucher emails runs once an hour by default. When adding a Gift Voucher in the control panel, you will need to add the recipient details. How do I turn on the Gift Voucher email? The Gift Voucher Program is an Add-On feature. It needs to be turned on and setup before you can start selling the gift vouchers. Check out how to turn on the Gift Voucher Program. How can I configure the Gift Voucher email? The email template can be edited in the control panel or using SFTP. To edit in the control panel, go to > Email Templates and select Gift Voucher Emails > Default. See below to edit the template using SFTP. Can't find the answer to your question? Ask Us!